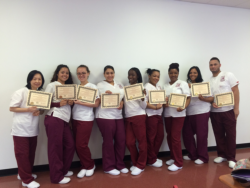 Students must be certified in New Jersey as a Nurse Aide, Homemaker/Home Health Aide, or Personal Care Assistant. The Program focuses on the knowledge and skills needed to accurately measure, administer, and document medications in Assisted Living Facilities. Upon successful completion of both the training program and State certification Medication Aide Exam, students will be certified as a Medication Aide. Medication Aide can advance their careers by pursuing either an LPN or RN Nursing Degree.